The transparency of most retinal cell classes typically precludes imaging them in the living eye; unless invasive methods are used that deploy extrinsic contrast agents. Using an adaptive optics scanning light ophthalmoscope (AOSLO) and capitalizing on the large numerical aperture of the mouse eye, we enhanced the contrast from otherwise transparent cells by subtracting the left from the right half of the light distribution in the detector plane. With this approach, it is possible to image the distal processes of photoreceptors, their more proximal cell bodies and the mosaic of horizontal cells in the living mouse retina. H. R. Novotny and D. L. Alvis, “A method of photographing fluorescence in circulating blood in the human retina,” Circulation 24(1), 82–86 (1961). M. Flocks, J. Miller, and P. Chao, “Retinal circulation time with the aid of fundus cinephotography,” Am. J. Ophthalmol. 48(1), 3–6 (1959). L. Yin, Y. Geng, F. Osakada, R. Sharma, A. H. Cetin, E. M. Callaway, D. R. Williams, and W. H. Merigan, “Imaging light responses of retinal ganglion cells in the living mouse eye,” J. Neurophysiol. 109(9), 2415–2421 (2013). L. Yin, K. Greenberg, J. J. Hunter, D. Dalkara, K. D. Kolstad, B. D. Masella, R. Wolfe, M. Visel, D. Stone, R. T. Libby, D. Diloreto, D. Schaffer, J. Flannery, D. R. Williams, and W. H. Merigan, “Intravitreal injection of AAV2 transduces macaque inner retina,” Invest. Ophthalmol. Vis. Sci. 52(5), 2775–2783 (2011). J. Schallek, Y. Geng, H. Nguyen, and D. R. Williams, “Morphology and topography of retinal pericytes in the living mouse retina using in vivo adaptive optics imaging and ex vivo characterization,” Invest. Ophthalmol. Vis. Sci. 54(13), 8237–8250 (2013). Y. Geng, A. Dubra, L. Yin, W. H. Merigan, R. Sharma, R. T. Libby, and D. R. Williams, “Adaptive optics retinal imaging in the living mouse eye,” Biomed. Opt. Express 3(4), 715–734 (2012). T. Y. P. Chui, D. A. Vannasdale, and S. A. Burns, “The use of forward scatter to improve retinal vascular imaging with an adaptive optics scanning laser ophthalmoscope,” Biomed. Opt. Express 3(10), 2537–2549 (2012). Y. N. Sulai, D. Scoles, Z. Harvey, and A. Dubra, “Visualization of retinal vascular structure and perfusion with a nonconfocal adaptive optics scanning light ophthalmoscope,” J. Opt. Soc. Am. A 31(3), 569–579 (2014). D. H. Scoles, Y. N. Sulai, C. Langlo, G. A. Fishman, C. A. Curcio, J. Carroll, and A. Dubra, “In vivo imaging of human cone photoreceptor inner segments,” Invest. Ophthalmol. Vis. Sci. 55, 4244–4251 (2014). W. Smith, Modern Optical Engineering, 4th Ed., 4 edition (McGraw-Hill Professional, 2007). A. Roorda, F. Romero-Borja, W. Donnelly, H. Queener, T. Hebert, and M. Campbell, “Adaptive optics scanning laser ophthalmoscopy,” Opt. Express 10(9), 405–412 (2002). A. Dubra, Y. Sulai, J. L. Norris, R. F. Cooper, A. M. Dubis, D. R. Williams, and J. Carroll, “Noninvasive imaging of the human rod photoreceptor mosaic using a confocal adaptive optics scanning ophthalmoscope,” Biomed. Opt. Express 2(7), 1864–1876 (2011). A. Dubra, Z. Harvey, B. Fischer, B. M. Dawant, and C. Lorenz, “Registration of 2D Images from Fast Scanning Ophthalmic Instruments,” in Biomedical Image Registration, Lecture Notes in Computer Science No. 6204 (Springer Berlin Heidelberg, 1), pp. 60–71. C. Schmucker and F. Schaeffel, “A paraxial schematic eye model for the growing C57BL/6 mouse,” Vision Res. 44(16), 1857–1867 (2004). 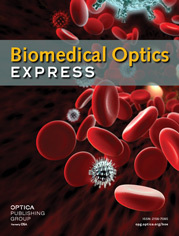 Y. Geng, L. A. Schery, R. Sharma, A. Dubra, K. Ahmad, R. T. Libby, and D. R. Williams, “Optical properties of the mouse eye,” Biomed. Opt. Express 2(4), 717–738 (2011). J. I. Yellott., “Spectral consequences of photoreceptor sampling in the rhesus retina,” Science 221(4608), 382–385 (1983). D. R. Williams and N. J. Coletta, “Cone spacing and the visual resolution limit,” J. Opt. Soc. Am. A 4(8), 1514–1523 (1987). R. F. Cooper, C. S. Langlo, A. Dubra, and J. Carroll, “Automatic detection of modal spacing (Yellott’s ring) in adaptive optics scanning light ophthalmoscope images,” Ophthalmic Physiol. Opt. 33(4), 540–549 (2013). C.-J. Jeon, E. Strettoi, and R. H. Masland, “The major cell populations of the mouse retina,” J. Neurosci. 18(21), 8936–8946 (1998). L. D. Carter-Dawson and M. M. LaVail, “Rods and cones in the mouse retina. I. Structural analysis using light and electron microscopy,” J. Comp. Neurol. 188(2), 245–262 (1979). R. A. Cuthbertson and T. E. Mandel, “Anatomy of the mouse retina. Endothelial cell-pericyte ratio and capillary distribution,” Invest. Ophthalmol. Vis. Sci. 27(11), 1659–1664 (1986). M. I. Dorrell, E. Aguilar, and M. Friedlander, “Retinal vascular development is mediated by endothelial filopodia, a preexisting astrocytic template and specific R-cadherin adhesion,” Invest. Ophthalmol. Vis. Sci. 43(11), 3500–3510 (2002). M. Paques, R. Tadayoni, R. Sercombe, P. Laurent, O. Genevois, A. Gaudric, and E. Vicaut, “Structural and hemodynamic analysis of the mouse retinal microcirculation,” Invest. Ophthalmol. Vis. Sci. 44(11), 4960–4967 (2003). S. Wang, M. P. Villegas-Pérez, M. Vidal-Sanz, and R. D. Lund, “Progressive Optic Axon Dystrophy and Vascular Changes in rd Mice,” Invest. Ophthalmol. Vis. Sci. 41, 537–545 (2000). S. Haverkamp and H. Wässle, “Immunocytochemical analysis of the mouse retina,” J. Comp. Neurol. 424(1), 1–23 (2000). M. A. Raven and B. E. Reese, “Horizontal cell density and mosaic regularity in pigmented and albino mouse retina,” J. Comp. Neurol. 454(2), 168–176 (2002). W. Liu, J.-H. Wang, and M. Xiang, “Specific expression of the LIM/homeodomain protein Lim-1 in horizontal cells during retinogenesis,” Dev. Dyn. 217(3), 320–325 (2000). R. W. Williams, R. C. Strom, G. Zhou, and Z. Yan, “Genetic dissection of retinal development,” Semin. Cell Dev. Biol. 9(3), 249–255 (1998). J. Shelley, K. Dedek, T. Schubert, A. Feigenspan, K. Schultz, S. Hombach, K. Willecke, and R. Weiler, “Horizontal cell receptive fields are reduced in connexin57-deficient mice,” Eur. J. Neurosci. 23(12), 3176–3186 (2006). A. Roorda and D. R. Williams, “The arrangement of the three cone classes in the living human eye,” Nature 397(6719), 520–522 (1999). R. S. Jonnal, J. R. Besecker, J. C. Derby, O. P. Kocaoglu, B. Cense, W. Gao, Q. Wang, and D. T. Miller, “Imaging outer segment renewal in living human cone photoreceptors,” Opt. Express 18(5), 5257–5270 (2010). C. A. Curcio, K. R. Sloan, R. E. Kalina, and A. E. Hendrickson, “Human photoreceptor topography,” J. Comp. Neurol. 292(4), 497–523 (1990). Y. Lee, S. Kameya, G. A. Cox, J. Hsu, W. Hicks, T. P. Maddatu, R. S. Smith, J. K. Naggert, N. S. Peachey, and P. M. Nishina, “Ocular abnormalities in Large(myd) and Large(vls) mice, spontaneous models for muscle, eye, and brain diseases,” Mol. Cell. Neurosci. 30(2), 160–172 (2005). J. J. Pang, X. Dai, S. E. Boye, I. Barone, S. L. Boye, S. Mao, D. Everhart, A. Dinculescu, L. Liu, Y. Umino, B. Lei, B. Chang, R. Barlow, E. Strettoi, and W. W. Hauswirth, “Long-term retinal function and structure rescue using capsid mutant AAV8 vector in the rd10 mouse, a model of recessive retinitis pigmentosa,” Mol. Ther. 19(2), 234–242 (2011). A. I. Cohen, “Some cytological and initial biochemical observations on photoreceptors in retinas of rds mice,” Invest. Ophthalmol. Vis. Sci. 24(7), 832–843 (1983). S. Rösch, S. Johnen, F. Müller, C. Pfarrer, and P. Walter, “Correlations between ERG, OCT, and Anatomical Findings in the rd10 Mouse,” J. Ophthalmol. 2014, 874751 (2014). J. Gao, K. Cheon, S. Nusinowitz, Q. Liu, D. Bei, K. Atkins, A. Azimi, S. P. Daiger, D. B. Farber, J. R. Heckenlively, E. A. Pierce, L. S. Sullivan, and J. Zuo, “Progressive photoreceptor degeneration, outer segment dysplasia, and rhodopsin mislocalization in mice with targeted disruption of the retinitis pigmentosa-1 (Rp1) gene,” Proc. Natl. Acad. Sci. U.S.A. 99(8), 5698–5703 (2002). J. Lem, N. V. Krasnoperova, P. D. Calvert, B. Kosaras, D. A. Cameron, M. Nicolò, C. L. Makino, and R. L. Sidman, “Morphological, physiological, and biochemical changes in rhodopsin knockout mice,” Proc. Natl. Acad. Sci. U.S.A. 96(2), 736–741 (1999). N. McNally, P. Kenna, M. M. Humphries, A. H. Hobson, N. W. Khan, R. A. Bush, P. A. Sieving, P. Humphries, and G. J. Farrar, “Structural and functional rescue of murine rod photoreceptors by human rhodopsin transgene,” Hum. Mol. Genet. 8(7), 1309–1312 (1999). H. Wässle, L. Peichl, M. S. Airaksinen, and M. Meyer, “Calcium-binding proteins in the retina of a calbindin-null mutant mouse,” Cell Tissue Res. 292(2), 211–218 (1998). L. Peichl and J. González-Soriano, “Morphological types of horizontal cell in rodent retinae: a comparison of rat, mouse, gerbil, and guinea pig,” Vis. Neurosci. 11(3), 501–517 (1994). K. Grieve and A. Roorda, “Intrinsic signals from human cone photoreceptors,” Invest. Ophthalmol. Vis. Sci. 49(2), 713–719 (2008). J. Schallek, R. Kardon, Y. Kwon, M. Abramoff, P. Soliz, and D. Ts’o, “Stimulus-evoked intrinsic optical signals in the retina: pharmacologic dissection reveals outer retinal origins,” Invest. Ophthalmol. Vis. Sci. 50(10), 4873–4880 (2009). J. Schallek, H. Li, R. Kardon, Y. Kwon, M. Abramoff, P. Soliz, and D. Ts’o, “Stimulus-evoked intrinsic optical signals in the retina: spatial and temporal characteristics,” Invest. Ophthalmol. Vis. Sci. 50(10), 4865–4872 (2009). D. Ts’o, J. Schallek, Y. Kwon, R. Kardon, M. Abramoff, and P. Soliz, “Noninvasive functional imaging of the retina reveals outer retinal and hemodynamic intrinsic optical signal origins,” Jpn. J. Ophthalmol. 53(4), 334–344 (2009). C. Gargini, E. Terzibasi, F. Mazzoni, and E. Strettoi, “Retinal organization in the retinal degeneration 10 (rd10) mutant mouse: a morphological and ERG study,” J. Comp. Neurol. 500(2), 222–238 (2007). S. B. Mehta and C. J. R. Sheppard, “Quantitative phase-gradient imaging at high resolution with asymmetric illumination-based differential phase contrast,” Opt. Lett. 34(13), 1924–1926 (2009). W. C. Stewart, “On differential phase contrast with an extended illumination source,” J. Opt. Soc. Am. 66(8), 813–818 (1976). A. B. Parthasarathy, K. K. Chu, T. N. Ford, and J. Mertz, “Quantitative phase imaging using a partitioned detection aperture,” Opt. Lett. 37(19), 4062–4064 (2012). W. B. Amos, S. Reichelt, D. M. Cattermole, and J. Laufer, “Re-evaluation of differential phase contrast (DPC) in a scanning laser microscope using a split detector as an alternative to differential interference contrast (DIC) optics,” J. Microsc. 210(2), 166–175 (2003). T. N. Ford, K. K. Chu, and J. Mertz, “Phase-gradient microscopy in thick tissue with oblique back-illumination,” Nat. Methods 9(12), 1195–1197 (2012). T. Wilson and D. K. Hamilton, “Differential amplitude contrast imaging in the scanning optical microscope,” Appl. Phys. B 32(4), 187–191 (1983). Fig. 1 Diagram of the split-detector AOSLO. (A) AOSLO system was adapted from the original confocal design . (B) The detection arm of the AOSLO shows the location of the knife edge prism at the retinal focus plane of the imaging system and the location of two photo multiplier tubes (PMTs). (C) The 2D retinal point-spread function at the imaging plane is diverted by the knife edge into two PMTs. Each channel is individually captured and the difference between the two channels is digitally calculated. WFS: wavefront sensor. DM: deformable mirror. Fig. 2 Images and power spectra of photoreceptor distal processes and outer nuclear layer somata. (A) Deep retinal focus shows a mosaic of tightly packed distal processes of the photoreceptor inner and outer segments. (B) Larger cell bodies of the photoreceptors are seen when the focal plane lies in the ONL. The visible differences in packing density are confirmed with the spatial frequency power spectrum, which shows packing density peaks at 7 and 23 cycles/deg. Fig. 3 The left panel (A-E) shows a through focus sequence of en-face images starting at the outer plexiform layer (OPL) and finishing slightly below the photoreceptor layer (see Media 1). A) The boundary of the OPL and inner nuclear layer (INL) is anatomically confirmed by the presence of the deepest layer of retinal vessels (white open arrowhead). (B-D)The multilayered structure of the photoreceptor somata is captured in en-face images from different focus depths within the outer nuclear layer (ONL). (E) The finer structure of the monolayer of photoreceptor distal segments in the photoreceptor layer (PRL). The right panel shows the axial rendering of 38 en-face images separated by equal dioptric steps as measured by the AO control software. Tick marks in the image represent data from a single imaged plane. Lines in between represent linearly interpolated pixels in the x-z representation. Distinct features in the en-face images (black arrows) are co-localized in the axial representation. Fig. 4 Sparse cellular mosaic captured in the outer plexiform layer. The density and size of these cells is consistent with previous findings of horizontal cells in the living retina. Fig. 5 Comparison between cells densities found in the current study and histological reports. Density estimates in the photoreceptor monolayer and horizontal cells show good agreement with previously reported density of this cell class. ONL somata show agreement with total number of rods when the density in a single plane of focus is scaled by a factor of 10, corresponding to the average number of axially stacked ONL somata. The horizontal cell densities also are consistent with four previous histological studies. Fig. 6 The distribution of horizontal cells in the mouse retina. Mean cell density increased as a function of ecentricity between 10-25 degrees from the optic disc. Data represents mean and standard deviation of counts from 4 analysts when analyzing 0.25 mm2 of retinal tissue shown in Fig. 4.